No Holds Barred Food Poll: Barbecue, Barbeque, BBQ - JP loves LIFE! When I decided to do a food poll each week of the summer, I knew this day would come. The day at which time, the gloves came off and I started the real debate. Nothing is more likely to get an argument going it seems in my travel than football conference loyalty or preferred barbecue style. Given the recent hubbub about football has settled down, and the biggest barbecuing holiday of the year is just ahead and wage an all out war with this week’s food poll! I will not pretend to be objective in this poll in anyway! I have a definite preference. While I can appreciate barbecue of other types, Memphis-style is what it takes to really satisfy my urge to have barbecue! 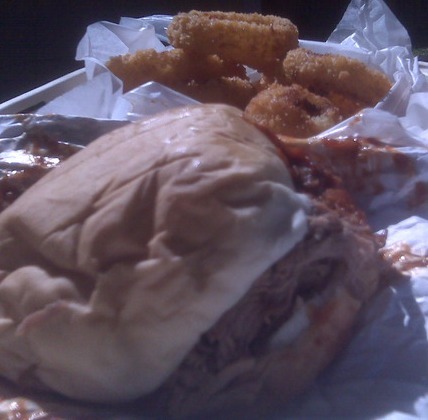 I love a good pulled pork sandwich like the one photographed here (from my favorite neighborhood joint Central BBQ). Sauce is to be done fairly lightly (if I wanted a sauce sandwich I’d ask for a sloppy Joe) and I can do with a little slaw (again, nothing should overpower the pork!). I love Memphis style ribs too! Tend to prefer them wet but I can put the hurt on some dry ones too! So what do you prefer? Here are the polls! Since I couldn’t possibly contain my thoughts in the poll alone, I welcome you adding thoughts below. Nebraska farmer Mark McHargue on Twitter and he shared his story on my blog too! I have to admit that with the plethora of barbecue options in Memphis, I rarely feel like I need to make my own sauce or dry rub. BUT I do trust this recipe a friend gave me cause he’s a great cook and took this so seriously when I pulled together a cookbook one year. Would love to know Jim is doing well and catching a lot of fish on Tombigbee! Mix together and keep it in the deep freezer or refrigerator in a shaker or ZipLoc bag. Sprinkle generously on meat as you prepare for the grill. Cook slowly. SALAD POLL RESULTS: What a close call! Spinach had one vote more than mixed greens and romaine, so it’s clear, that green salads are the favorite! What I like best about this poll is the diversity of suggestions readers added in the comments section! I think my answer has to be pork shoulder (surprise, surprise), but beef brisket is right there too. Definitely KC Style with sides of slaw and onion rings. Smoking chicken this weekend though. Oh…and according to AP style, it is barbecue. Tsk Tsk. I use barbecue most frequently as you can see in the text but BBQ is so easy. Not sure who spells it with a q but I welcome the diversity…. even if the people are wrong! LOL. Now for my weekly over-ramble on Janice’s blog…..I’m not sure I know what makes the difference is in BBQ (or Barbeque for the blog word police, hehe) styles- not sure. So, why am I commenting? I dunno! I think Kansas City’s is a richer sweeter sauce? Then I’m lost! But I know how MY people like BBQ! It’s hard to imagine but I’ve never really had BBQ ‘out’. It isn’t that common at restaurants around here. Although, my middle son will travel for BBQ. This area is known for grilled pork chops–it is the top fund raiser of all for our area. On pork chops they use a rub called “Barron” made in St. Louis and as a rule we like to marinade it over night. I also use it for ribs & pulled pork. We eat a lot more pulled pork because I can make a lot and freeze it. It’s handy when we are in the field! Which is the schedule my life rotates around. But, ribs are a favorite around here. I’ve tried everything and finally found the less is best. Spray foil with Pam, coat ribs with BBQ sauce or dry rub-wrap in the foil for 24 hrs-then bake or grill (or bake & then finish on the grill) take foil off at the last. The end. I don’t have time for smokers and all that stuff! For pulled pork at home we usually keep the BBQ sauce on the side-a very high tech secret–BBQ sauce -Maull’s original & KC type mixed w/little br sugar (depending on how the pork is cooked). We have Park’s Locker in neighboring town that does whole hog pulled pork–for most –I would say 80% of all big events and weddings (locally) serve Parks Locker BBQ on the menu. It’s a bit too saucy for my gang and kind of a muddled orange color, very sweet & shredded to more of a mince-(My husband says he’ll chew his own food, Thanks!). In other words, it’s not what my bunch wants most of the time. I have bought the roasted hog (he cooks it outside on a big old cooker for ya) just shredded then sauced it myself. I do this if I’m making for a large crowd–mix small amount of melted grape jelly w/sauces, toss with the meat–to lightly cover. I’m all about promoting my Beef! It’s hard for me to type this….but, for BBQ? bring on the pork! I’m boring and I’m good with that-but, I can throw a fundraiser and Pork has been my friend to raise money for everything from football, Post Prom, to our fire department. ALTHOUGH- Bossy Bingo is the easiest money I’ve ever helped raise! But, I won’t post details on a food blog hehe. Oh and if not baling on the 4th-brats & hamburgers here! I may have to get you some Memphis barbecue sauce. Mace may say he likes KC style best, but he was all about buying some Memphis sauce when he was here! Central BBQ in Memphis is yummy, Jannice, but I think Oklahoma Joe’s in KC is pretty hard to beat. It’s my current fave in the old home region. I have to agree with Mace. It may not have been one of the Big Three in KC, but Oklahoma Joe’s was usually our top choice. I still haven’t made it to the original one, though; we lived just a few minutes from the Olathe one. My time living in KC skews my opinion a bit that way, but I usually end up with a combination of sorts. A good sweet sauce with either some slaw or mustard-based sauce on pulled pork is hard to beat. A good beef brisket with a smoky sauce would be my choice, but growing up on Nebraska beef makes one pickier about what’s good beef. 🙂 And I’ll take ribs any way I can get them so long as they’re good and meaty. Whatever the case, if you don’t get some on you then it’s not really barbecue. What a great outlook. I think you are probably going into politics as much as Brandon is! We really should meet up and enjoy some barbecue someday! Let me know when you come this way! I grew up in Memphis but have lived in NC for longer than I lived in Memphis. Memphis barbecue is the best! Hushpuppies are for fish not barbecue. I love a brisket if cooked right, but If I say I want barbecue it means PORK! And I like it with dry rub while cooking and sauce served at the table. I can’t wait for you to prove how much better that is! I’m a sucker for a good brisket, although ribs (pork OR beef) are a favorite of mine. I have a passion for messy foods. Love your site….from another once upon a time ‘city’ girl to farm girl (going on 40 years now!!! ), I hope you’ll visit my blog: whatsthebeeffromsouptonuts.blogspot.com. It’s so good to have such positive information online! Nice! Earth Day is definitely everyday on farms and ranch across the US. Some of the best stewards of our resources like land & water are farmer for sure! I prefer to let the meat speak. Just a bit of salt and don’t over cook it. Yeah all of that seasoning stuff is OK for a change, but let me have it hot and medium rare no matter what the meat.